Happy Canada Day, eh? I encourage non-Canadians out there to embrace your inner U! What was in my swag bag from the TD Canadian Childrens' Book Centre Awards event Had a great time celebrating Canadian children's books at last night's TD Canadian Children's Book Centre Awards gala! 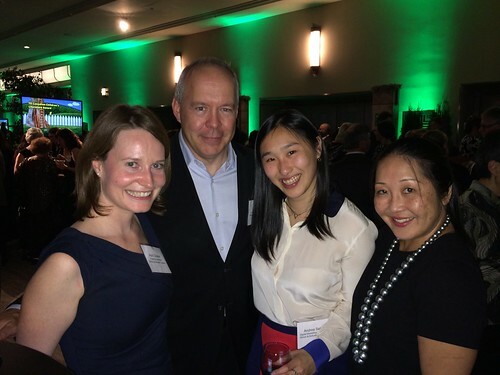 This was my second time attending the event, and it was just as fabulous as last year's. Lots of great conversation with kidlit-types before the ceremony began, lots of yummy food and drinks, cheering on the finalists/winners, inspiring speeches. And then champagne and decadent desserts! I opted to leave my regular camera at home and just use my iPhone 5s to take pics this time. I was pretty happy with how most of them turned out (much better than the flash photos my old iPhone took), though I had to warn people about the double flash...one small pre-flash then the main flash along with the photo being taken. The first flash helps the phone camera determine color temperature. With my sister Ruth, whose KENTA AND THE BIG WAVE (Annick Press) and FOX AND SQUIRREL (Scholastic Canada) came out earlier this year. KENTA got a starred review in Kirkus! Speaking of which, I'm looking forward to attending a mega-celebration bash tonight to celebrate Simon & Schuster Canada's new publishing program! There was also a special TD Canadian Children's Literature Fan Choice Award given to Polly Horvath for her novel, ONE YEAR IN COAL HARBOUR. And Loris Lesynski (author) and Michael Martchenko (illustrator) gave a short speech about their Annick Press picture book, BOY SOUP, being shared with first grade students across Canada as part of the TD Grade One Book Giveaway. That's 500,000 copies!! 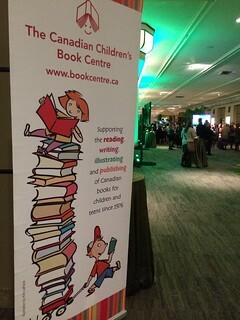 Thanks to TD and the Canadian Children's Book Centre for a fine event, and congrats to all the finalists and winners. You can browse the list of all the finalists at the Canadian Children's Book Centre Awards on the CCBC website as well as more detailed info about the awards, jurors, etc. in this CCBC press release. Stella, the star of Marie-Louise Gay's picture books and a television series based on her stories, is being featured in a series of stamps issued by Canada Post.